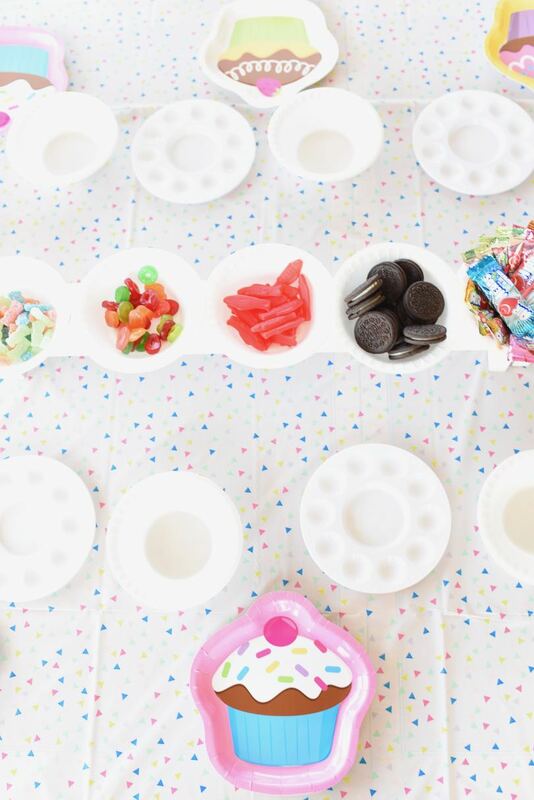 You are here: Home / DIY / Cupcake Wars Birthday Party + FREE Party Printables! 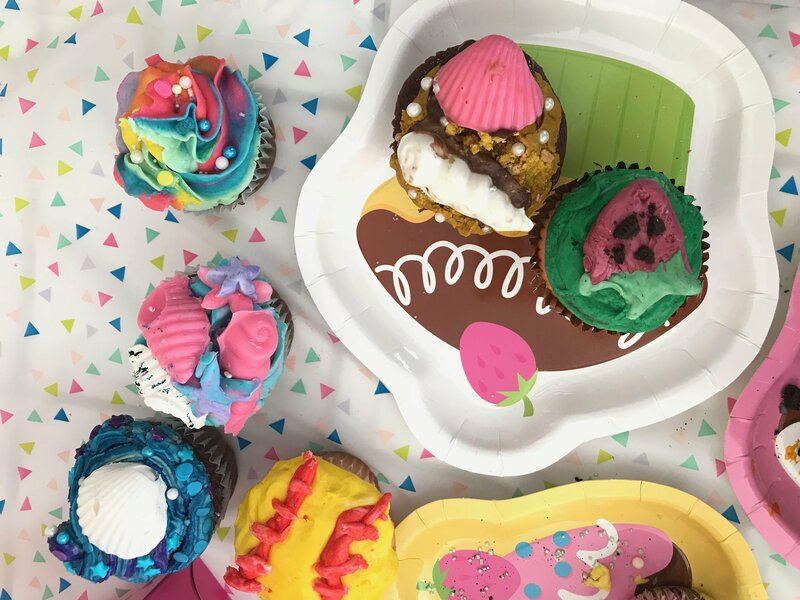 Cupcake Wars Birthday Party + FREE Party Printables! My daughter has been obsessed with Cupcake Wars for a while now, so when it came time for her birthday this year, of course she wanted a Cupcake Wars Birthday party! If you’ve seen Cupcake Wars, you know that it’s a fast-paced cupcake baking competition. 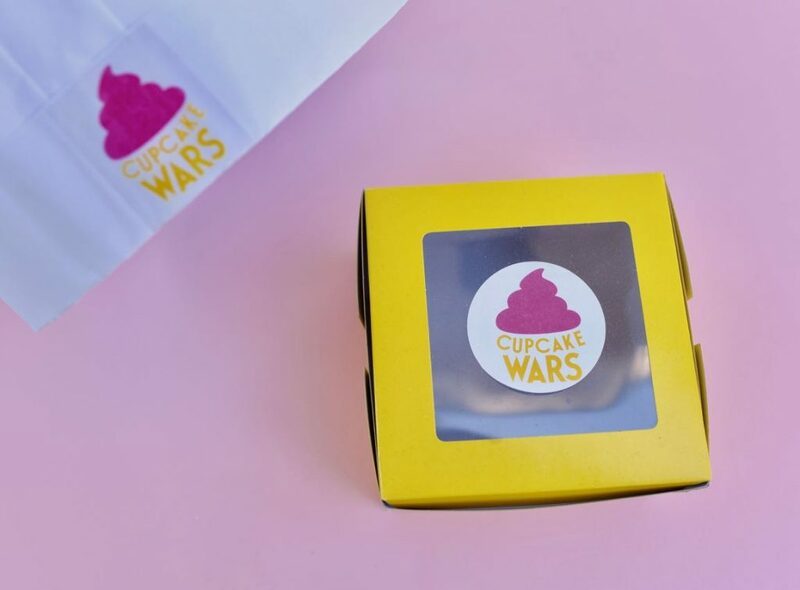 Four teams compete in three challenges and one team is the ultimate Cupcake Wars champion. 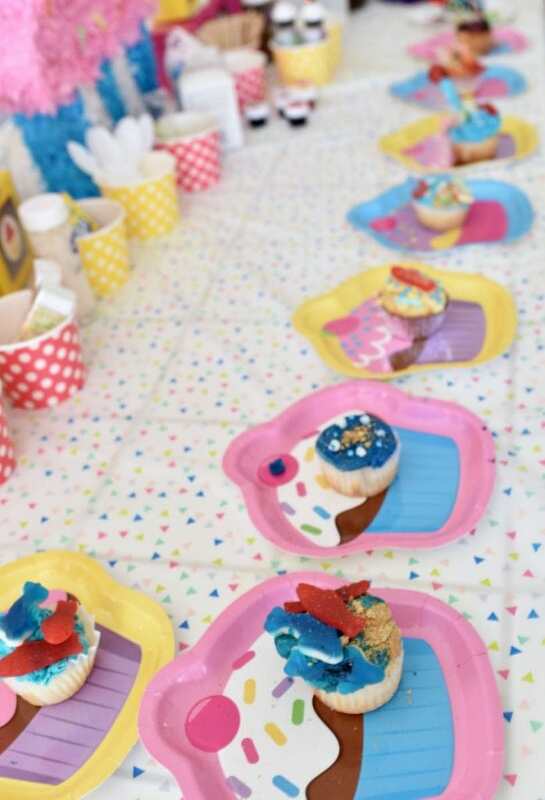 I’m thrilled to share with you our Cupcake Wars birthday party. The girls all had SO much fun, and my daughter said it was her favorite birthday party ever, so that’s a win in my book! 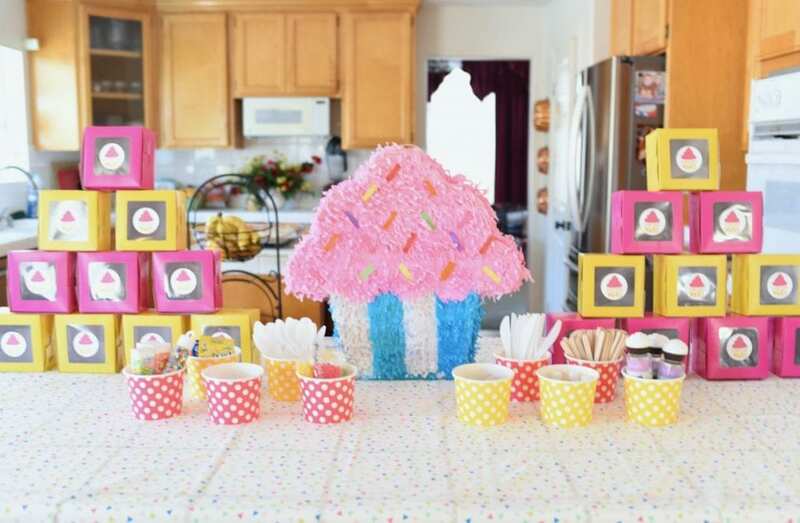 Keep reading for ALL the party details, plus some FREE Cupcake Wars party printables that I created and am sharing with you! This post contains affiliate links, which means that I make a small percentage of any purchase made at no extra cost to you. On Cupcake Wars, sometimes team members will wear matching outfits. 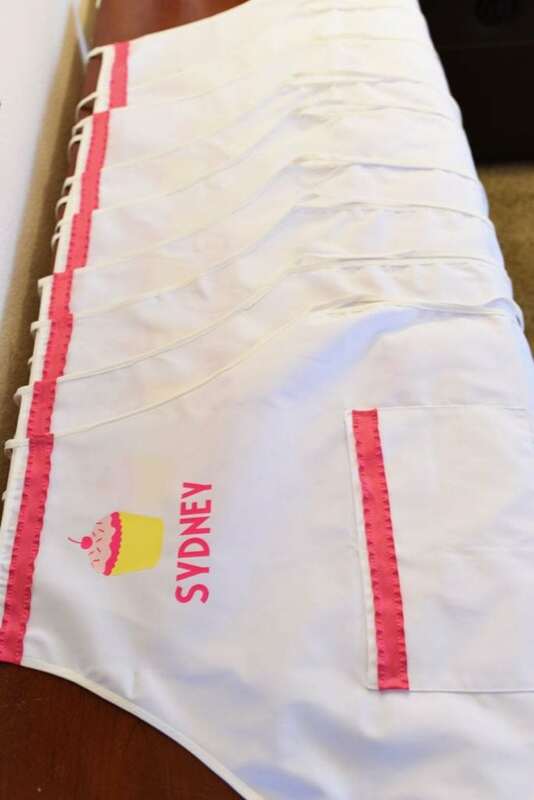 I thought it would be fun for the girls to all have matching personalized cupcake aprons, so I made them each their own apron with their name on it. I found some great priced white kids aprons, then added a cute cupcake in our party colors (bright pink, light pink, yellow, and white) with iron-on. I also added each girls’ name under the cupcake, along with some cute pink ruffle ribbon. I shared exactly how I made the personalized aprons and shared the FREE cut file too! 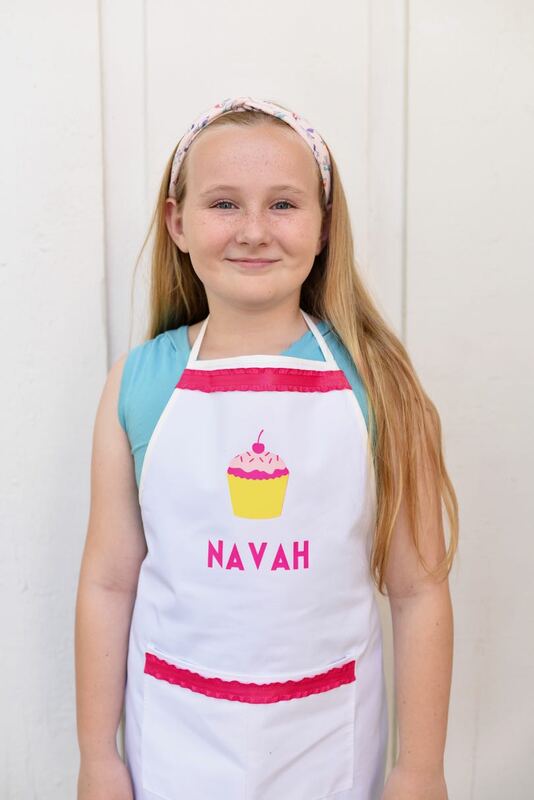 If you have a Cricut machine (or know someone who does), you can use my design and just change the girls’ names on the aprons and make your own. The girls LOVED their aprons! They were so excited to put them on, and were extremely excited that they got to keep them. They were the perfect Cupcake Wars party favor. Aprons were also a great idea because the girls definitely got messy, and I didn’t want their clothes to be covered in food coloring and frosting during the party. I also decorated some Cupcake Wars chef hats too. 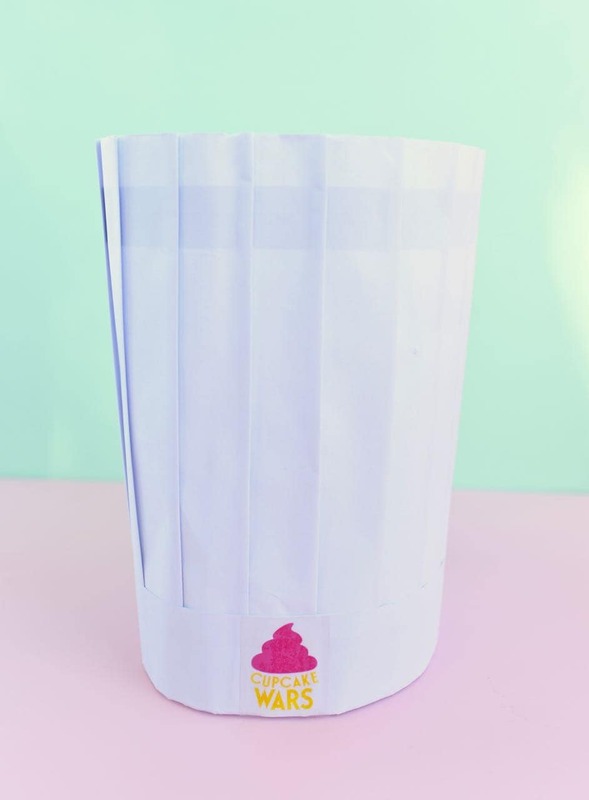 I got some tall paper chef hats, then added a clear sticker to the front of the hat with the Cupcake Wars logo on it that I created. 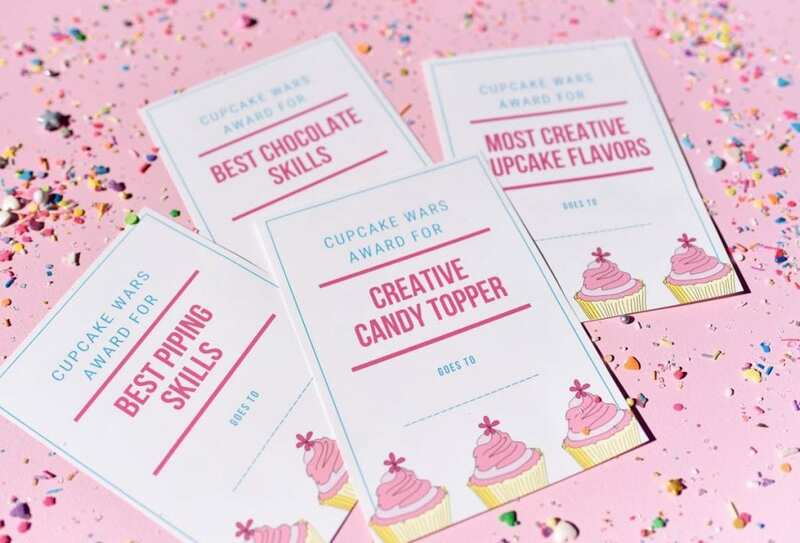 I’m sharing my FREE Cupcake Wars logo and sticker cut file to cut these with a Cricut machine. I used clear sticker paper, but white sticker paper works great too! 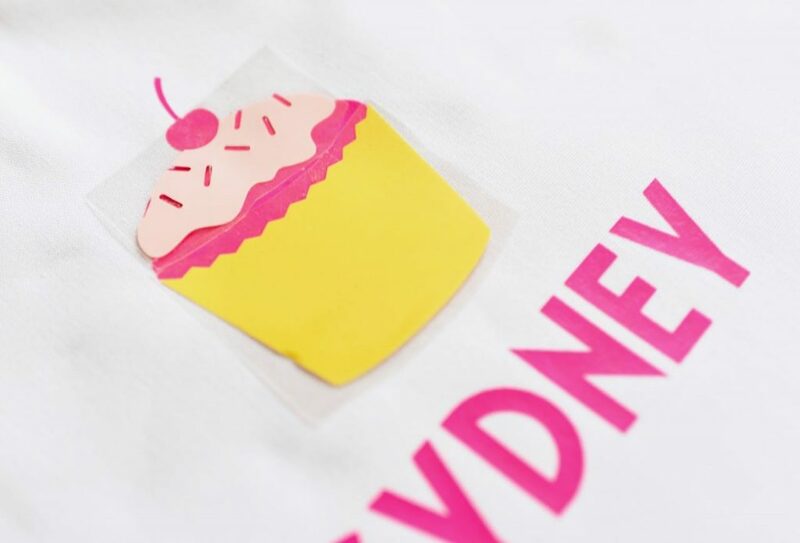 You can learn more about how to make stickers using Cricut Print then Cut to make your own design. I knew that we were going to be at the table for pretty much the entire party decorating cupcakes, so I kept the decorations simple. 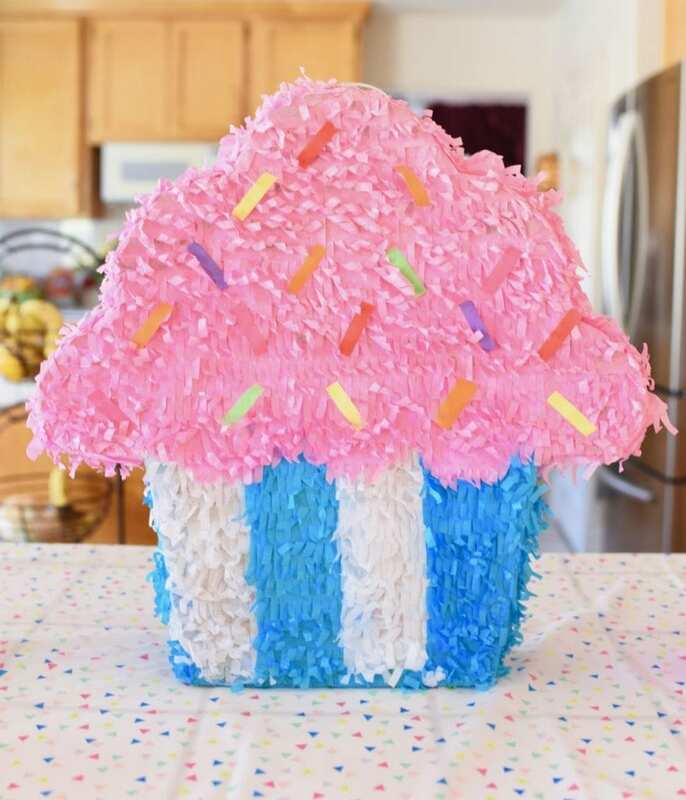 I bought a big cupcake piñata and placed it on the middle of the counter for decoration (we broke it later). All around the cupcake piñata were lots of the cupcake making supplies that the girls could grab and use. 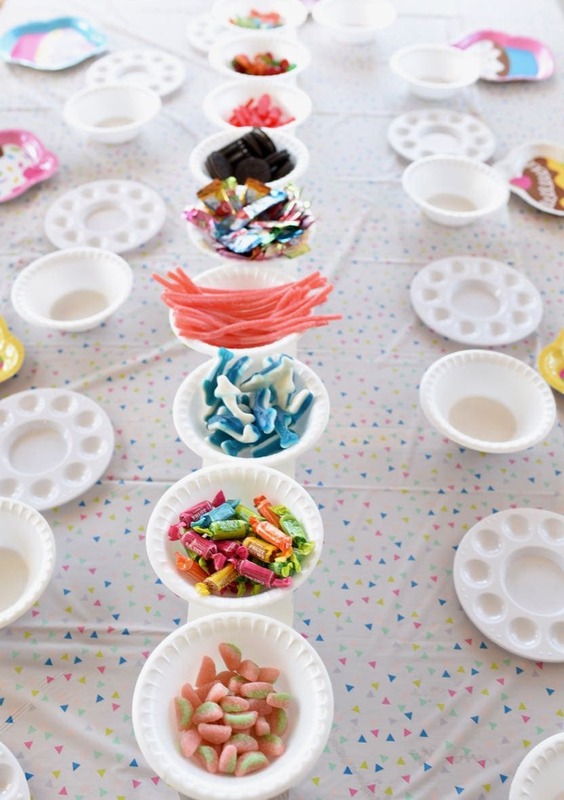 Decorative paper cups were filled with cupcake tips, flavoring oil for the frosting, food coloring, sprinkles, knives, spoons, and other tools for them to decorate with. Colorful cupcake boxes were stacked on either side of the piñata with the same Cupcake Wars logo I created. I printed and cut the same sticker I used on the hats. This time I printed them on white sticker paper. When the party was over, the girls got to take home their cupcakes in the cute cupcake boxes. They couldn’t wait to show their families their sweet creations! To get ready for the party, I premade 72 cupcakes. I used store-bought cake mixes in chocolate, birthday cake, and strawberry flavors to save some time. I also made four big batches of homemade buttercream frosting. This might seem like a lot, but it was exactly enough for the girls. They use SO much frosting! Other topping ideas: fruit, nuts, etc. I used my invaluable chocolate melting pot to keep two different colors of melted chocolate warm and ready to go. If the girls wanted to make a chocolate topper, they just spooned the melted chocolate into the mold then put it in the freezer so it would harden faster. They LOVED this and blew me away with their creativity!! I also made up a batch of simple marshmallow fondant. The girls were able to shape different things with it and top their cupcakes with them. 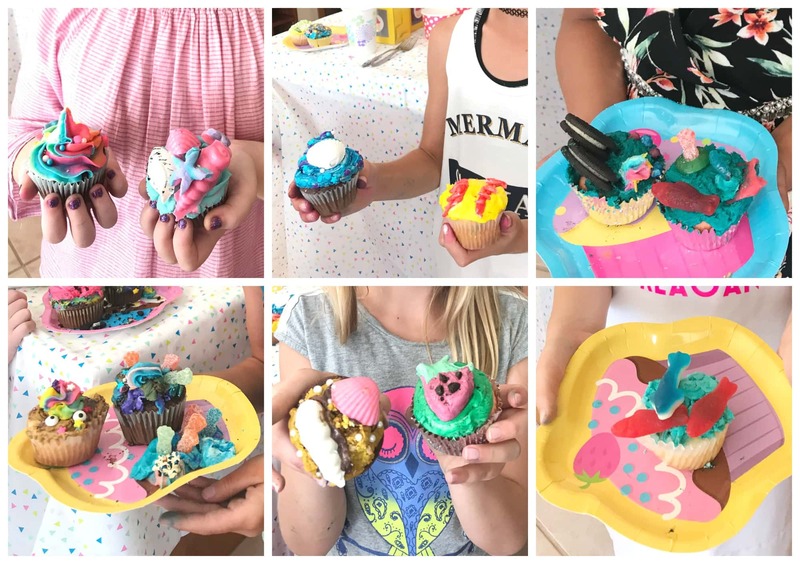 For each round of competition, the girls had to create cupcakes that had the summer theme, which was pretty wide open- the beach, ocean animals, swimming, summer vacation, etc. While the actual Cupcake Wars competition is three rounds, after much deliberation we decided to do two rounds for the party. My daughter was insistent that the girls get to add their own flavoring and coloring to their cupcakes. I loved the idea, but it did take a bit longer, which is partly why we ended up doing two rounds. The other reason is that the girls were given melted chocolate, along with a handful of plastic chocolate molds, so they could easily make chocolate cupcake toppers. At the start of the party, I explained the rules and how Cupcake Wars works, just in case any of them hadn’t seen the show. 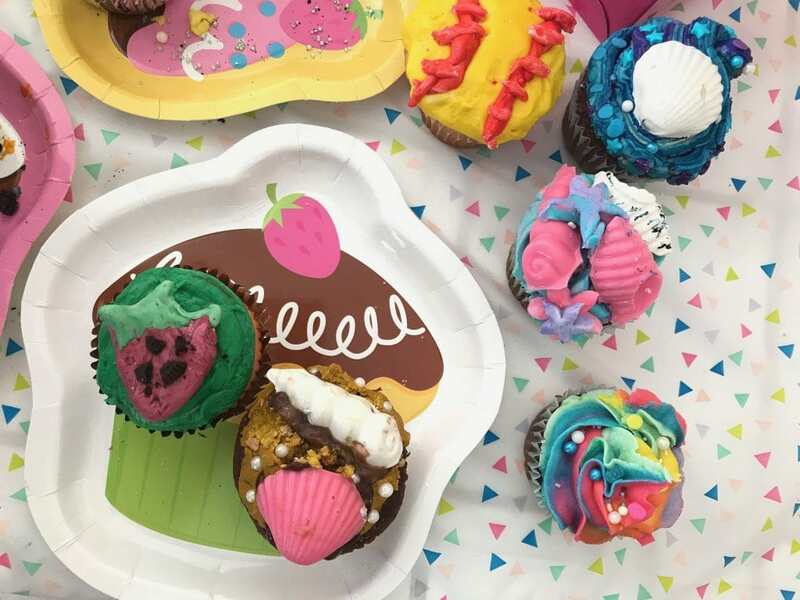 I also went over each of the cupcake tools and supplies and showed them how to fill the disposable icing bags, how to add the tip, how much flavoring to add to the frosting, how to add color to their frosting, how to use the chocolate melter and molds, etc. They were all ears during the lesson and asked lots of questions. I love that they were actually paying close attention! 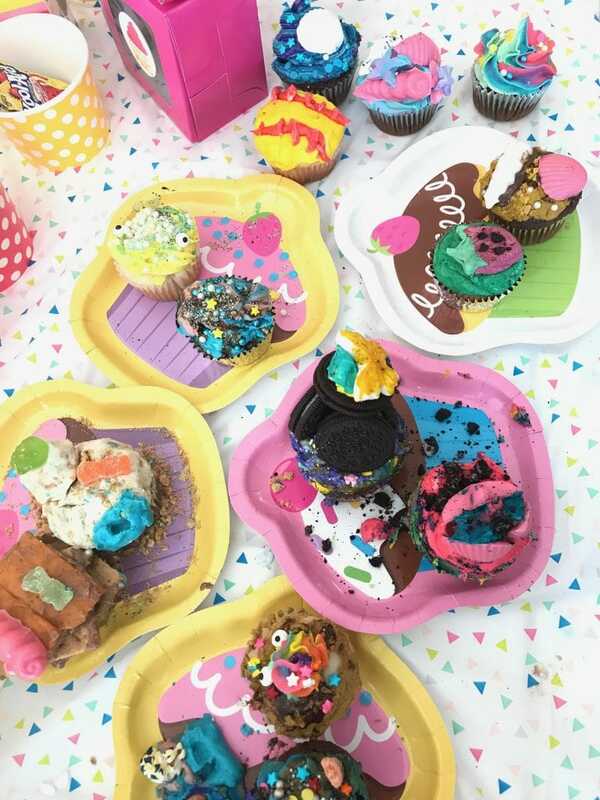 Each place setting at the Cupcake Wars party table was decorated with a cute cupcake paper plate, a plastic bowl for mixing up their frosting with their colors and flavors, and a brand new round plastic paint palette. 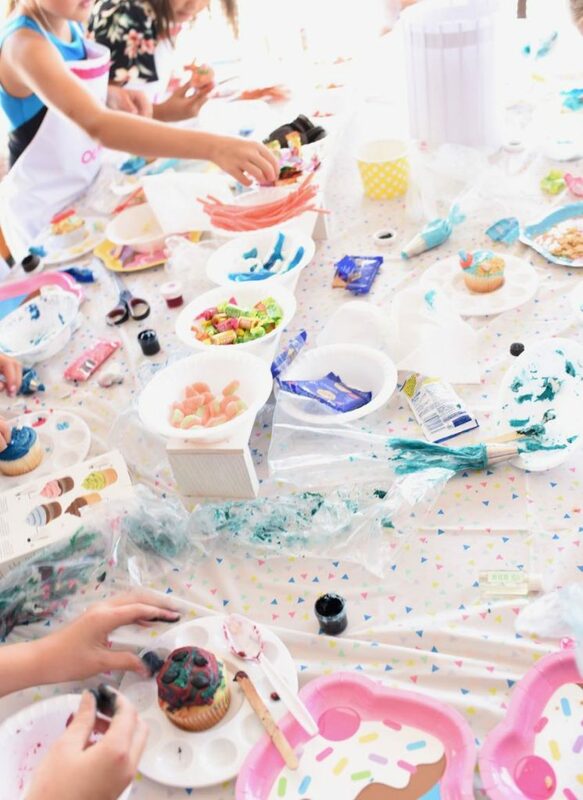 While decorating their cupcakes, the girls placed their cupcake in the center of their paint palette, then placed the sprinkles and candies they wanted inside the smaller round holes. This worked really well for us! 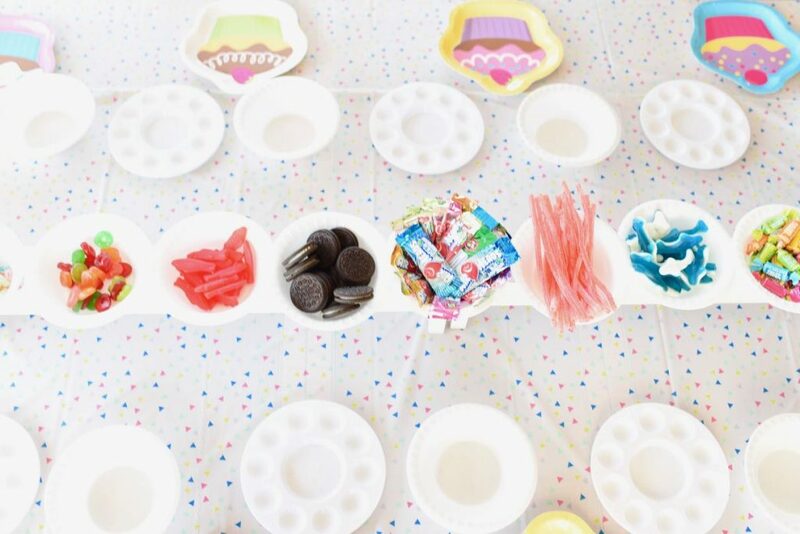 Down the middle of the table was a white wood stand I made that held all of the plastic bowls filled with candy for the girls to decorate with. Below is the only photo I got of the girls actually making their cupcakes. The party was VERY fast-paced and I was busy helping girls with their piping bags and tips the whole time. At the beginning of the two rounds I explained what the judges would be looking for in that round. In round 1, the judges were judging just by taste and the girls created one cupcake. In round 2, the judges were judging just by looks and the girls created two different cupcakes. There were a lot of girls, and I didn’t want our judges to get sick with all that sugar and frosting. This way the girls could take home their two cupcakes from the last round too. I had each girl “present” their cupcake to the judges, just like on the show, and explain the flavors they used and the decorations on their cupcakes. The judges then used a spoon to take a small taste of the cupcake (only in round 1), then explain what they loved about each cupcake. I talked to the judges ahead of time about finding good things about each cupcake, and the judges rocked it! They found small details about each cupcake that they loved, and were so sweet to the girls. They sure made my mama heart happy! We knew that we didn’t want any of the girls to be eliminated from our Cupcake Wars birthday party competition. We wanted it to be creative and fun, but with no one winner. To do this I anticipated what some of the awards should be beforehand, then made up certificates ahead of time. This way at the party we could just fill in the winner’s name on each certificate. Quick and easy! 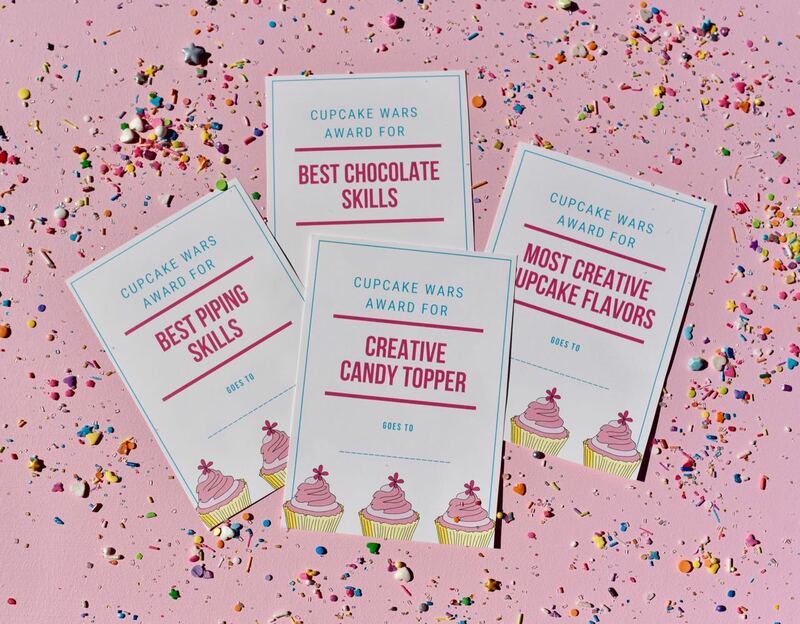 Our Cupcake Wars certificates turned out pretty cute, if I do say so myself. 😉 If you’d like to use my certificates, you’re in luck. I’m sharing them with you! In between cupcake rounds, we took a snack break. I put out a veggie tray with ranch dip, apples, mandarins, pretzels, and drinks for the girls to snack on. My goal was to counteract all that sugar from the cupcakes and toppings. After the competition and awards ceremony, we sang happy birthday and my daughter opened up her presents. Then the girls all went outside to break open the cupcake piñata, and then they came back inside and boxed up their cupcakes in their cupcake boxes. Our Cupcake Wars birthday party was a huge success! The girls were truly creative and really enjoyed getting creative with their cupcakes. I’m not going to lie, it gets VERY messy, so be sure to have lots of paper towels, plastic gloves, and a plastic tablecloth to help with the messes. If you have any more questions about our Cupcake Wars birthday party, just leave a comment and I’d be happy to help!